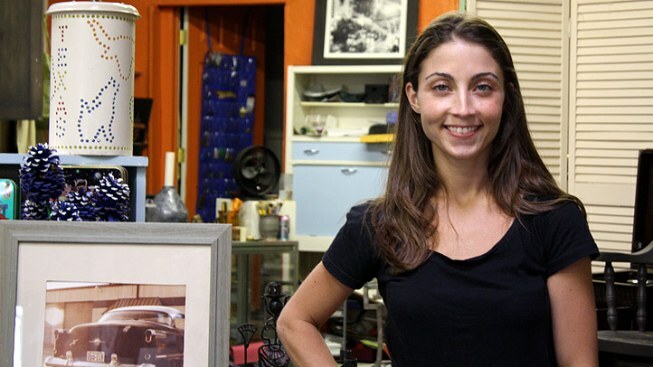 Owner Mary Padian amongst all her finds in her shop, Mary's Finds. She searches garage sales, thrift stores and street sides for antique furniture and vintage clothing and art. One man's trash is Mary Padian's treasure. Upon meeting her for the first time, you'll notice a few things: she's fearless, pint-sized, and is crazy passionate about digging through garage sales, thrift stores or even junk left on the street in search of the coolest furniture, antiques, paintings, and knick-knacks. The Dallas native puts all her finds in her own vintage boutique called just that -- Mary's Finds. Located in the Design District on the border of downtown Dallas, the shop sells one-of-a-kind and refurbished furniture, home decor and vintage clothing at affordable prices. "If it looks good, I trust my instinct," Padian said. Padian graduated with a photojournalism degree from the University of Texas at Austin in 2003 and to follow her random approach to life, she moved to New York City. She ended up landing a job at the iconic magazine, Architectural Digest, and was taken under the wing of the famed editor-in-chief, Paige Rense. Padian created monthly videos called "Mary's Finds," where she would find affordable and unique home pieces. After five years of the Big Apple, she said she missed her huge family, consisting of 42 first cousins. "I think it gets to a point where you’re living in New York for so long, and it's just tough," she said. "I would’ve had to eventually move to Los Angeles...and I was wanting to come home." As soon as set foot back home in Dallas, she realized she wanted to turn the monthly videos she made at the mag into a physical reality. After her uncle suggested the open space next to his law office on Market Center Boulevard, it only took her six months to put it all together -- and she continues to run the place complete by herself. "I have no business experience but I figured, 'What the heck?' I've always wanted to open a store," Padian said. When it comes to filling her shop with finds, Padian said she searches high and low, even going to old neighborhoods and talking to people who have dumped anything interesting in their backyards. She even drives out to "podunk" towns in her endless search of anything vintage. "It’s interesting how this business works. I go to the most random places to find this stuff. I have no fear," she said. 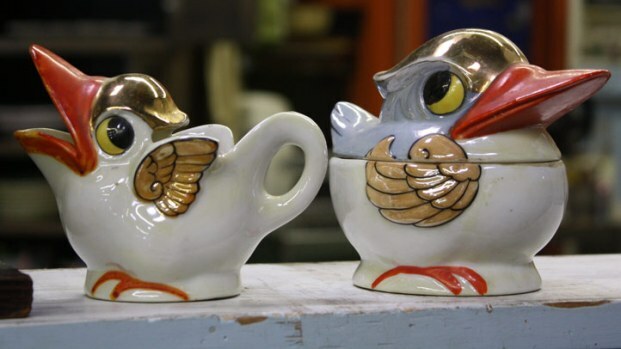 She names off a few contacts whom she visits each month to find new treasures -- “Nash” and “Rodney” -- elderly folks who have accumulated antiques over the years. “They have stuff you just can’t get anymore,” she said. After Padian collects her finds, she refurbishes many of the furniture and pieces with a brand new coat of paint or by adding a funky mirror or design, such as a coffee table she sketched a picture on with an empty ballpoint pen. Even with no training in art or furniture building, she’ll do anything to give her final, stylish touch. Some of her quirkiest finds include a Louis Vuitton inspired Felt bike she found in Webster, TX, an antique hair dryer and an old punch-in clock. She credits many who influenced to her taste, style and drive in going for anything. Her experiences as an intern at D Magazine set her on the path to NYC, where, at Architectural Digest, she grew to know prominent designers on a personal level and picked up on their knowledge and decorum. She also grew up across the street from artist Nic Nicosia, whose work is featured in the Dallas Museum of Art and Museum of Modern Art in NYC. Padian said the tricky part is maintaining the whole business by herself and juggling the work and finding things that are up to par for her shop. She said she plans to take it day by day and hopes to eventually hire an extra set of hands. "And if I closed down tomorrow, it would be fine, too. I’ve worked so hard so either way, so I’m happy," she added. "I totally just winged it. Anybody can do anything if they have a drive to do something. Absolutely." Mary's Finds is open Wednesday through Saturday from 10 a.m. to 6 p.m. She spends the rest of the week refurbishing furniture and finding pieces to add to the collection. Prices on the items, which can range from below $20 to over $200 for certain pieces, are negotiable.